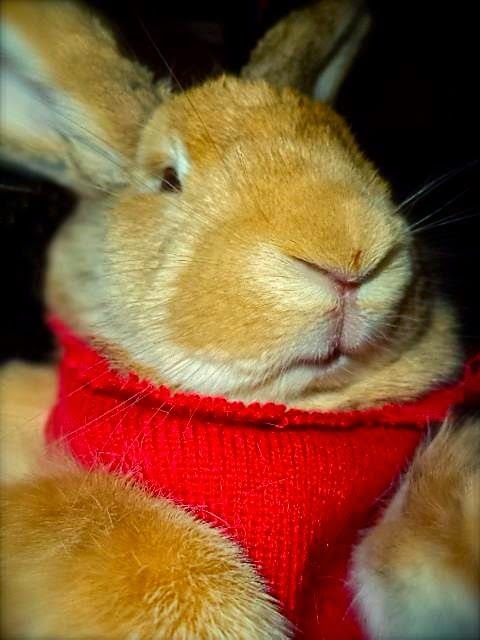 Snow is not for bunnies.... and this sweater business just adds insult to injury. Dandelion-nog? If I have to deal with cold, can I at least have some dandelion-nog? But, Pipkin, you look so dreamy. All the little bunnettes must be just swooning. ... and Pipkin is not really showing much disapproval with the mouth. Maybe already had some dandi-nogs! Or the photo caught him off guard? Of course your natural fur is most beauteous, but the sweater offers a debonair option, as if you were meeting someone for a hot toddy apres ski. Pipkin, I think you are enjoying playing the smooth debonair bunny too much. You are the one who is supposed to be ordering up whatever you want and dealing out injury for any perceived insult. The hoomins didn't offer you some kind of special treat to act out this "softer side of bunny" brainwashing video, did they? Just grovel to your hoomins and you'll be cool. I don't think it is going to catch on, but well, who knows with mass media?